Outdoor toys are not just for toddlers and preschoolers, they're for babies too. Enjoy playing with your little ones, with toys designed for outdoor play. Childhood is a time when education is essential. Kids are bombarded with reading, math and basic knowledge, but learning and development are not dependent only on their classroom experiences. Even the very young can learn, and do, so long as you stimulate them through imaginative play, and of course through allowing them access to the correct learning and development toys. They need more than ABCs and 123s; they need to learn and improve physical and social skills too, and those are things they will never learn within the four walls of a class room environment. Playing outdoors with friends is one of the best ways to improve in these areas. Childhood is the time when smiles and laughter are highlighted in their innocent faces. Parents want to cultivate (and capitalize!) on these areas of growth, with the goal of raising a happy and well developed child being their main focus, and using educational toys, whether indoors or out, is a great way to do so. How can a parent help their baby play in the water safely alongside Mom or Dad? This Swimways Baby Spring Float provides ample safety. It's wide enough for your baby to be tucked safely inside, and, unlike other floaters, this one doesn't need parents to hold the baby; it keeps your baby floating alone, so both mommy and baby will be happy. Even if baby can't hold himself upright in the floater, he can lean on the mesh ring for support without toppling over and can still reach his toys easily for even more fun. 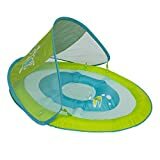 The helpful sun canopy can be detached as needed, and makes this a great outdoor toy for babies ... even if it does involve fun in the water! From the tummy up, baby can stay dry, while the Baby Spring Float provides great floating support. Kids love to play in the sand, and this castle bucket set will be a fun addition to their outdoor play. The pieces are safe for toddlers and babies, and the colors are attractive to kids of every age. A shovel, watering can, rake, and scoop are included, and the sand spinning wheel is a fascinating addition to sand or water play. The bucket is more than a simple bucket - it can be used as a sand castle mold in the sandbox, and it can provide great fun even in the bath tub. As kids get older, more molds can be added to their castle bucket set, and in the meantime they will have heaps of fun with this wonderful starter set. It's extremely healthy for babies to simply be outdoors every once in a while. The outside world is very entertaining for one thing and, even more, it's a source of wonder and discovery for children. This Little Tikes Swing, with its T-bar feature, keeps babies as young as eight months old securely seated; how ever these types of outdoor toys for babies will always require adult supervision. When your child reaches toddlerhood, the T-bar can be taken off easily to convert it from a baby swing into an outdoor toy for children. The design makes it a strong, durable, and sturdy toy, as you would expect, coming from Little Tikes, that will last through baby's toddler years. The seat has ample room for baby's growth, but not so much that they will sit too loosely. It's an excellent infant swing for either indoors or outdoors - highly recommended.